The Gambia is roughly the size of Cornwall and despite the River Gambia running the entire length of the country only one-sixth of the land is arable. In a report published in June of 2018 the International Monetary Fund ranked The Gambia as the ninth poorest country in the world with many of the other countries in the top twenty being some of it’s West African neighbours. In the Gambia it is estimated that 15% of the population are disabled and across Africa there over 80% of amputees will go without a prosthetic leg. However, with a limited paper trail, transport barriers in the more rural parts of the country and people simply not being able to afford to seek medical attention it’s almost impossible to know the true impact of the issue. 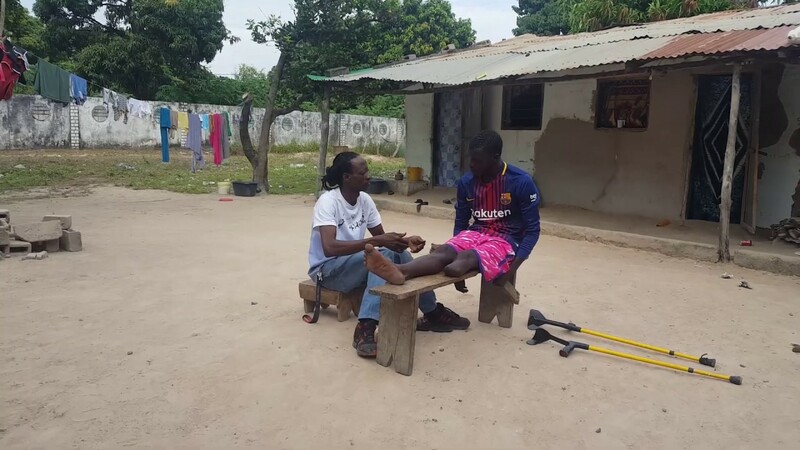 Gabu is The Gambia’s sole prosthetist at it’s only mobility clinic based in the capital Banjul and his small team of technicians are working hard to keep up with the high demand. Components are recycled from used artificial legs collected in and shipped from the U.K. to stock the clinic. Here an amputee is expertly assessed for a fitting, the team take into account the patient’s posture and mobility as part of this assessment. Once an artificial leg has been made to fit it needs a stump sock and liners pad the patient’s leg, and a suspension belt keeps the leg attached if the amputation is above the knee. The team teaches recipients to walk with their new leg and how to care for their stump they then make an onward referrals to the physiotherapy department where people learn exercises to keep their legs strong and flexible. For many years amputees would have to travel to neighbouring Senegal for treatment which for most was not financially viable so having a mobility centre in The Gambia that is functioning and able to receive equipment from Legs4Africa has been an essential development. We still have work to do though, we want to make sure that the mobility centre is well stocked with raw materials, that medical students elect to work in the field of prosthetics and that improved social awareness encourages amputees to seek the help from Gabu and his wonderful team. After three years of growth we saw the need for amputees in The Gambia to have somewhere to talk through the problems around being an amputee, share their experiences and connect with each other. Thus the Gambian Amputee Association or “The GAA” was born in 2016. Amputation can lead to isolation, unemployment, poor mental health and social stigma as well as the physical barriers that come with having a limb amputated such as bruising, phantom limb pain, learning to use a prosthetic leg and accessibility. The GAA acts as an advocacy group, targeting the government about disability rights issues and mental wellbeing is a huge part of the rehabilitation process. Focusing on community-based rehabilitation within the GAA means that amputees can support their peers face to face on a monthly basis or on Facebook page which acts a forum in between meetings. Regular meetups give board members the opportunity to discuss any further needs that members of the group might have and provide information, advice and guidance to other services including sports teams, training schemes or mental health. We are very fortunate to have Bob Jabbie working as our community support officer with GAA members and amputees in the community on behalf of Legs4Africa. A lack of awareness and understanding around disability in The Gambia can cause amputees to socially withdraw. Bob work tirelessly to ensure that amputees remain engaged with their community, know about services that are available to them and offer advice and support. Interview with The Gambia’s only prosthesis at the RVTH in Banjul. Our rehabilitation project in The Gambia is supported by UK Aid from the UK Government. The project it is aimed at increasing the output of the mobility centre, growing the numbers in attendance at the GAA meetings, and upgrading the service that they provide. Thanks to the financial input from UK Aid we have been able to put two GAA members on counselling courses so that professional support can be provided internally. We can now work on initiating a peer support network so that amputees can share the emotional trauma that limb loss and stigma can evoke with people who can truly empathise – each other. The project has also gained the generous support by one of and regular donations as well as gifts through the following trusts.